Fellows will work on research, economic policy, technical assistance, and lending operations that contribute to the World Bank goal of eliminating poverty and increasing shared prosperity. This year, the program is run by the World Bank’s Office of Chief Economist for Africa in collaboration with the Fragility, Conflict & Violence (FCV) Unit. 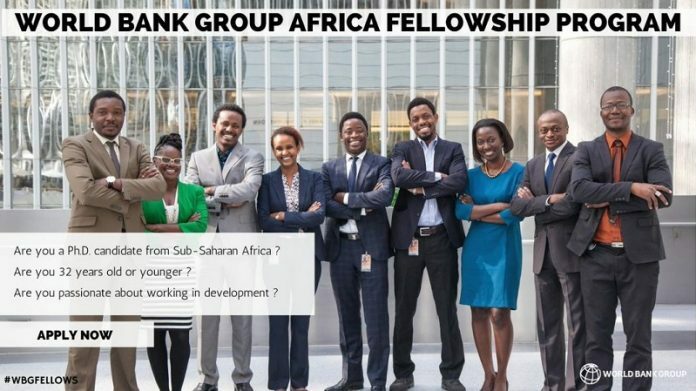 Started in 2013 by World Bank Africa Vice President Makhtar Diop, the World Bank Group Africa Fellowship Program aims to build a pipeline of Sub-Saharan African researchers and professionals, particularly women, who are interested in working in the development field at home or abroad, and in starting careers with the WBG. Many graduates of the fellowship program have gone on to join the WBG, and others have pursued promising development careers around the world. Sub-Saharan nationals who are recent Ph.D. graduates, or current doctoral students within a year of completing or graduating from a Ph.D. program in the following fields: economics, applied statistics and econometrics, impact evaluation, education, health, energy, agriculture, infrastructure, demography, forced displacement, and all relevant development fields. This year, thanks to a generous contribution from the United Kingdom’s Department for International Development (DFID), there are 10 additional fellowship positions with a special focus on forced displacement. The 10 selected fellows will work on forced displacement research in the context of operations led by the World Bank Group (WBG) or the United Nations High Commissioner for Refugees (UNHCR) in Sub-Saharan Africa, South Asia, or the Middle East. For these additional 10 positions, candidates from refugee and internally displaced communities and/or with proven experience on forced displacement will be given a priority. Selected candidates with a strong interest in the area of forced displacement will work on research programs targeting refugees, internally displaced persons (IDPs), and host communities. The deadline to submit an application is November 15, 2017. After applying online, the most suitable candidates will be identified, and their application packages forwarded to World Bank Africa Region managers and participating departments for consideration. Departments and managers will then indicate their preferences, as well as the project to be undertaken. Selected candidates will then be notified and, upon acceptance, will be hired as short-term consultants for a minimum of six months. Fellows will receive consultant fees, round-trip economy class air travel to Washington, D.C. or a WBG country office from their university, and worker’s compensation insurance. Next articleMo Dewji Foundation Scholarships 2017 for high performing Tanzanian Students. Could you consider older students. The age limit cuts off many of us. This is a very good and noble initiative. My only dissapointment is the prohibiting age limit. At 40years, I should have been open for such a great opportunity to give my contribution to Africa.